The Dallas Fuel and Team Envy are owned and operated by Dallas-based Envy Gaming, one of the largest esports organizations in the world. OP Live Dallas Powered by Team Envy and the Dallas Fuel is a premier esports event running Sept. 22-23, 2018, at the Irving Convention Center in Irving, Texas. According to Geoff Moore, President of Envy Gaming, “Everyone at Envy Gaming is excited to bring the real-life competition of the Overwatch League to the big stage of OP Live Dallas. [We] look forward to bringing local fans a competition they will never forget..."
eGency Global, a leading esports production, marketing and talent management firm in collaboration with SMU (Southern Methodist University) Guildhall, the top ranked graduate school for video game design in the world, are pleased to announce the addition of a collegiate Overwatch tournament powered by Team Envy and the Dallas Fuel to the line up of events at OP Live Dallas. 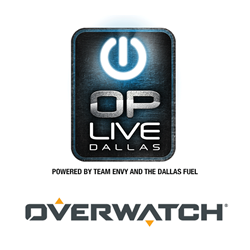 The Overwatch tournament at OP Live Dallas will feature 16 collegiate teams that will vie for the title of Over Powered Champ and a special prize package provided by the Dallas Fuel and Team Envy. Individual participants will also receive a welcome package from the Dallas Fuel and Team Envy. Collegiate Overwatch teams interested in participating in the tournament can contact C. Thatcher via email at cthatcher(at)tradegroup.com. Along with cheering on their favorite collegiate Overwatch teams, fans will have the opportunity to meet Dallas Fuel head coach Aaron “Aero” Atkins, Dallas Fuel general manager Mat “TazMo” Taylor, as well as Envy Gaming owner Mike “Hastr0” Rufail. In addition, the Dallas Fuel and Team Envy staff will be onsite for autographs, fan coaching sessions, educational sessions and more. Dallas Fuel and Team Envy swag will also be available to fans at the event. Chris Stone, CEO of eGency Global, is pleased to be partnering with Team Envy and the Dallas Fuel for OP Live Dallas’ inaugural event. “Whenever we put on an esports event, fans are always our number one priority, just as they are for Team Envy and the Dallas Fuel. We couldn’t dream of better partners to help us kick off OP Live Dallas than Team Envy and the Dallas Fuel,” Stone says. Along with the largest collegiate Overwatch tournament in North Texas, OP Live Dallas Powered by Team Envy and the Dallas Fuel will feature other gaming events, the latest video games created by SMU Guildhall students and alumni, pro esports player meet-and-greets, interactive experiences, a High School Hackathon, education about esports, sponsorship opportunities, an exhibitor hall and more. To purchase tickets for OP Live Dallas Powered by Team Envy and the Dallas Fuel and get event updates, visit http://www.OPLiveDallas.com/. For information on sponsorship opportunities (digital, event app, brand activations, signage, event/activity/workshop sponsor, broadcasting rights, and more) or securing exhibitor space, contact Ward Eastman, eGency Global Director, Strategic Alliances at 214-957-7870 or weastman(at)egencyglobal.com. Dallas Fuel, one of 12 esports franchises selected to compete in the inaugural season of the Overwatch League, is owned and operated by Dallas-based esports organization Envy Gaming, Inc. Envy was founded as a professional Call of Duty team in 2007 and has grown into one of the largest and most winning esports groups in the world. The internationally diverse Dallas Fuel roster consists of the best talent from around the globe. For more information on the Dallas Fuel, follow the team on Twitter @DallasFuel.